In June 2007 a very special event will happen in the aviation world. A restored Avro Vulcan Mark 2 – XH558 – will take to the air again to help commemorate the 25th anniversary of the Falklands conflict. 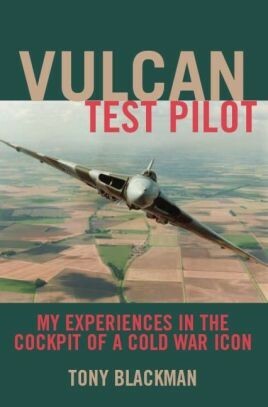 To coincide with this the memoirs of one of its test pilots, Tony Blackman, will be published – the first ever book about test flying this monumental delta-wing aircraft which dominated the history of the late 20th century. Tony is the ideal man to write such a tale as he flew no less than 105 of the 136 built, logging 850 flights at over 1,327 hours. His book will describe in layman’s terms what it was like to tame the first prototypes and to master the unusual characteristics necessitated by the Vulcan’s shape. Although Tony puts the developments, demonstrations, incidents and accidents in their political and historical context, his story is a highly personal one. He explains how this awesome aircraft became a national treasure and captured the imagination of the whole country. His words, descriptions and hitherto largely unpublished photographs will make people feel as he did the excitement of handling such an incredibly powerful monster always in the knowledge that he had to be in complete charge all the time as the monster could and did bite back.